I have been told today that my 5 y.o (prep) is having trouble with Fine Motor Skills. I asked for his teacher to maybe give him extra help as he seems to be struggling with his reading and letter word recognition. She said his writing/drawing is shaky and has trouble with pencils, cutting etc. What I don't understand is what is the difference with these skills and fiddly things i.e those fiddly little lego men, shoe laces etc. which he has no problem with. My issue was with his sight words (he just doesn't seem to get it) but they seem to think its Fine Motor Skills and think going to an OT may help. Any advice please. He will be 6 in January. Comments for 5 y.o and Fine Motor Skills. fine motor skills and fiddly things! Often parents wonder what the difference is between the fine motor skills needed for handwriting, and the ability to do "fiddly things" - using the computer mouse is often quoted as well as lego etc! On the one hand, getting kids to actively use their hands in play does generally develop their hand strength and dexterity; but sometimes kids have some degree of fine motor delay, and even the usual kids games don't get their finger muscles to move as well as they should. For good handwriting, the thumb, index and middle fingers (the tripod fingers) need to grip the pencil properly and then move together to control the pencil with minimum effort. Not all kids' toys and games get those tripod fingers to work together well, and kids whose muscles are a bit weak, or have some degree of uncoordination, tend to use their fingers stiffly even in play. Then when they have to use their fingers for handwriting, they struggle. An OT would be able to evaluate your son's overall hand skills and assess whether there is a need for intervention. Some kids just need a boost. You can have a look at the fine motor activities on my site, specifically the hand exercises if you want to try some with him at home. The other issue is the reading/sight words that you are concerned about. It sounds like the teacher did not hear your concerns properly - perhaps because her overriding concern was for the fine motor skills. If it were me, I would make an appointment with the OT, then go back to the teacher and let her know you have made the appointment, and then bring up the reading issues again. 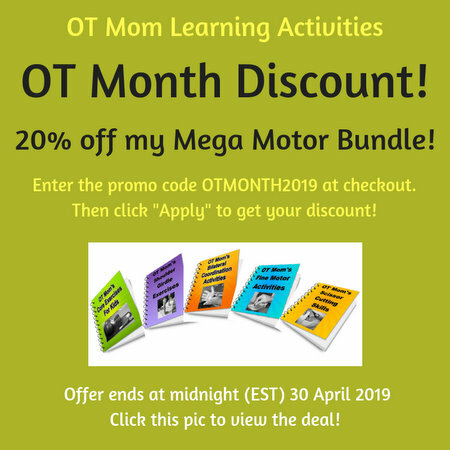 Where I work, the OTs include visual perceptual assessments such as visual memory for sight words etc, in their overall assessment of the child, so you could also raise your concerns about your son's reading with the OT.